Quietly and unexpectedly, Francisco Cervelli has turned himself into one of the majors' best catchers behind the plate and has become the unheralded MVP of the red-hot Pirates. Quiet: He must be, more than anything else, quiet. It would not be such an easy thing for Francisco Cervelli, who since he was a boy was always the loudest and flashiest on a field. Twelve years ago, a scout for the Yankees watched him on a neighborhood field and told him, “You’re talented. But you’re crazy.” As a catcher, you are many things during a game—cheerleader, strategist, negotiator, therapist—and Cervelli always loved shifting into all the different roles. But before he could become a great catcher, there was a simple lesson he had to learn. Behind the plate, with the glove, you must be relaxed, controlled, calm. ​Cervelli was speaking on Thursday, by phone from Chicago: it was a day off for him, a day after one of the most impressive streaks of the season ended: 56 consecutive scoreless innings caught. The streak, which had tied a 112-year-old club record, had been snapped in the sixth inning of the Pirates' game against the White Sox on Wednesday at U.S. Cellular Field. It is, according to the Elias Sports Bureau, the longest consecutive scoreless innings streak for a catcher since 1957, since Gus Triandos caught 52 straight shutout innings. The red-hot Pirates still won, 3–2, and they won again 3–2 on Thursday, their eighth straight victory. After a slow start, Pittsburgh is suddenly 39–27, just four games behind the Cardinals. Cervelli, in his first season as a starter after years as a backup for the Yankees, is one of the season’s great revelations. He is the best under-the-radar acquisition from last offseason and is the real MVP of the Pirates, the best team in baseball since early May. After years of learning from some of the great ones—Ivan Rodriguez, Jorge Posada, Jose Molina, Russell Martin, Brian McCann—Cervelli has become a maestro in the art of pitch framing. He is elite with the glove, underrated with the bat (a career .285 hitter, he’s hitting .316 with a .396 OBP this season) and deserving of an invite to next month’s All-Star Game. After years in the shadows, he has emerged as one of the best catchers in the game—even though it was not so long ago that he was first learning how to catch. 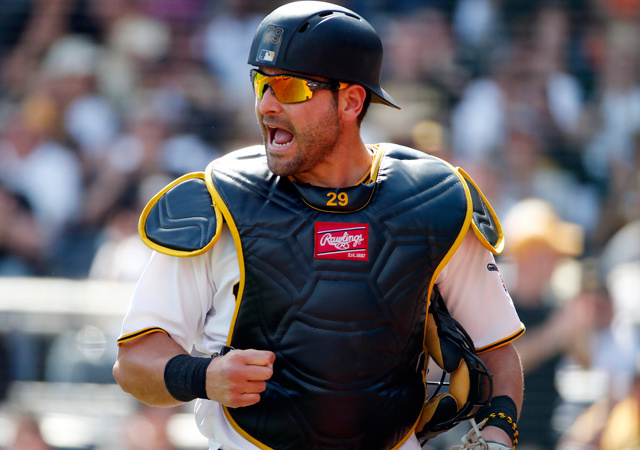 Cervelli—he played third base and shortstop—told him he’d never caught. “Just one throw,” Rios said. Cervelli got off the bench and went behind the plate. He took a pitch and fired a laser to second base. That was all Rios needed to see. “Later that day, I signed,” says Cervelli. That was 12 years ago. “Now I feel like I was born to catch,” he says. Two winters ago, McCann cost the Yankees $85 million, as well as a first-round pick. This off-season, Pirates general manager Neal Huntington acquired Cervelli from the Yankees for reliever Justin Wilson. The Pirates are paying Cervelli just under $1 million, and, as others have argued, you could say that Cervelli has been the team’s most valuable player for this season. The Pirates’ leaders in Wins Above Replacement, as measured by FanGraphs, are Gerrit Cole (2.3) and Andrew McCutchen (2.3), with Cervelli not far behind (1.9). But WAR does not factor in pitch framing value, and according to StatsCorner.com, no one has been better at framing than Cervelli: His 11.5 runs saved above average is ahead of the likes of Buster Posey and Yadier Molina. By measure of Baseball Prospectus’s ratings, only Posey and Yasmani Grandal have been better. Framing—the art of receiving a pitch in such a way that’s more likely to be called a strike—doesn’t appear in a box score and isn’t measured by an advanced metric like WAR. But with the emergence of pitch tracking data like PITCHf/x, we can quantify which catchers have been turning balls into strikes. Framers, it’s becoming clear, have long been among the most undervalued players in the game, but now the great masters are being more prized than ever. Despite being 31, Martin got $82 million from the Blue Jays because he is one of the best offensive catchers in the game, but also because of his framing skills. Of course, being a catcher is many other things other than a framer of pitches. Cervelli has also taken ownership of a staff with an eclectic mix of personalities. Former teammate Andy Pettitte taught him the importance of learning every starter and reliever on the team, and during the spring, Cervelli took each of his pitchers out to lunch and dinner. Cervelli must manage different repertoires and temperaments; three months into his first season as a Pirate, he knows his pitchers as well as anyone. Pittsburgh’s starting staff is the best in baseball, with a 2.83 ERA entering the weekend. The Pirates are on fire: 21–5 over their last 26 games, 26–11 since May 11 after a 31–34 start, headed toward their third straight postseason appearance. This is the most balanced—and most dangerous—Pirates team we’ve seen. And so far, they’ve been lead by an unheralded catcher who is finally getting a chance. Cervelli may not continue to hit like this—his batting average on balls in play is .396. But even if he cools off at the plate, he’ll remain one of the key players in Pittsburgh because of what he brings behind the plate, where he is now in control and, more than anything else, quiet.